INTRODUCTION: For patients with perihilar cholangiocarcinoma (CCA), surgery is the only treatment modality that can result in cure. Unfortunately, in the majority of these patients, the tumours are found to be unresectable at presentation due to either local invasive tumour growth or the presence of distant metastases. For patients with unresectable CCA, palliative chemotherapy is the standard treatment yielding an estimated median overall survival (OS) of 12-15.2 months. There is no evidence from randomised trials to support the use of stereotactic body radiation therapy (SBRT) for CCA. 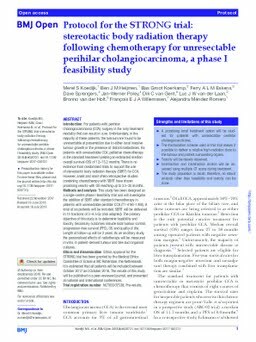 However, small and most often retrospective studies combining chemotherapy with SBRT have shown promising results with OS reaching up to 33-35 months.METHODS AND ANALYSIS: This study has been designed as a single-centre phase I feasibility trial and will investigate the addition of SBRT after standard chemotherapy in patients with unresectable perihilar CCA (T1-4 N0-1 M0). A total of six patients will be included. SBRT will be delivered in 15 fractions of 3-4.5 Gy (risk adapted). The primary objective of this study is to determine feasibility and toxicity. Secondary outcomes include local tumour control, progression-free survival (PFS), OS and quality of life. Length of follow-up will be 2 years. As an ancillary study, the personalised effects of radiotherapy will be measured in vitro, in patient-derived tumour and bile duct organoid cultures.ETHICS AND DISSEMINATION: Ethics approval for the STRONG trial has been granted by the Medical Ethics Committee of Erasmus MC Rotterdam, the Netherlands. It is estimated that all patients will be included between October 2017 and October 2018. The results of this study will be published in a peer-reviewed journal, and presented at national and international conferences.TRIAL REGISTRATION NUMBER: NCT03307538; Pre-results.